2018 Election Commentary: How Can You Stand Up for Forestry? - Find AMO's "When Globalization Meets Mainstreet" panel VIDEO here. Counting Caribou: How Did Canada's Most Populous Ungulate End Up On Ontario's Endangered Species List? OFIA Supporting Document: How Did Canada's Most Populous Ungulate End Up On Ontario's Endangered Species List? How Can We Make Ontario Open for Business? The Alliance: The Alliance Questions Who Will Stand Up for Forestry in Ontario? The Alliance: "Ontario Government Provides Window of Opportunity to Get Species at Risk Policy Right"
The Alliance: "NRDC Does Not Speak For Us"
How Do We Keep Good Paying Jobs in Northern and Rural Ontario? OFIA / Habitat for Humanity GTA Joint Release: Trump May Not Want Ontario Lumber - But Habitat for Humanity GTA Does! 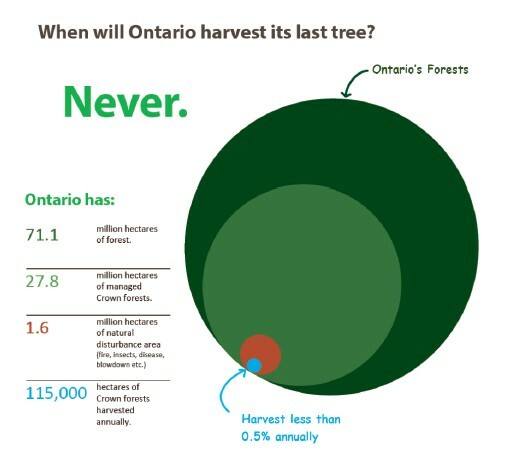 Infographic: When will Ontario harvest it's last tree? Never! © Ontario Forest Industries Association 2016. Built by BizZone.